Please note that you can mark one of rally point tabs as favourite. Management: On this page you can upgrade your rally point or activate/deactivate the troop evasion (this is a Gold club feature). 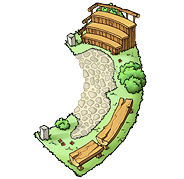 Overview: This page gives you an overview about all troop movements in your village. You will find there 4 buttons at the right upper corner which give you the opportunity to filter for incoming troops, outgoing troops, troops stationed in this village or oases and troops stationed in other villages or oases. Send troops: On this page you can send troops away. Combat Simulator: You can use the combat simulator to calculate your loses in a specific battle. A detailed explanation about the combat simluator you can find here. Farm List: Farm lists are a Gold club feature; therefore you only see this tab in case you have activated the Gold club. A detailed explanation about farm lists you can find here. You can mark an incoming attack/raid with different colour-codes. In addition each header will also be colour-coded to improve the overview. In addition to the village name, you will be able to see the coordinates of the village sending an attack, raid or reinforcements. If the number of all units within an attack/raid is lower than the current Rally Point level of the defending village, the defender will see the unit types approaching his village. He will not see the exact numbers, but the unit types only. In the image above you can see approaching Phalanxes. No other unit types are approaching within that attack or the following raid.